PHNOM PHEN, Cambodia – The government of Cambodia granted official recognition to the Cambodian Lutheran Church Association on January 15. The government approval allows the 32 congregations and 17 pastors to begin working towards creating a constitutional framework and a founding convention. 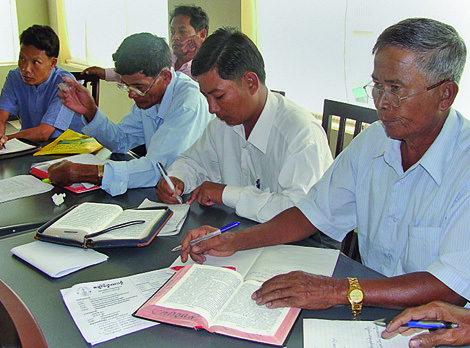 Currently, Lutheran Church–Canada (LCC) is assisting Luther Institute Southeast Asia (LISA) to provide theological training for the church’s pastors, deacons and deaconesses with funding assistance from Concordia Lutheran Missionary Society (CLMS). LCC missionary Rev. Dr. Leonard Harms, who serves as executive director of LISA, explained that the desire for establishing a Lutheran Church body in Cambodia came from the pastors and their congregations. The government approval allows the church complete freedom for worship, evangelizing, teaching and undertaking social ministry. In addition, the governor of the city of Phnom Penh granted registration to work in the city of Phnom Phen. Most of the teachers and professors have come from Lutheran Church–Canada and included seminary professors as well as parish pastors with expertise in specific areas. The eleventh seminary session for the churches in Southeast Asia begins in early March when Dr. Norman Threinen, a professor emeritus at Concordia Lutheran Seminary in Edmonton, will teach Pastoral Theology and Church Polity.